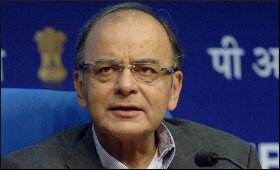 The government has the disinvestment target of Rs 85,000 crore in the current fiscal, said Finance Minister Arun Jaitley on Friday. The target for the current fiscal is Rs 5,000 crore more than the set target for 2018-19, added Jaitley in his official Twitter handle. "As against a target of Rs 80,000 crore for disinvestment for the current year, the divestment receipts have touched Rs 85,000 crores today (Friday)," Jaitley said in a tweet. As of February 28, 2019, the government had raised only Rs 56,473 crore through disinvestment, or 70 per cent of the full-year target of Rs 80,000. With uncertainties over some sell-offs, achieving the target seemed difficult at the beginning of this month. The Power Finance Corporation-Rural Electrification Corporation (PFC-REC) merger deal, by which the PFC acquired the government's stake in the REC, has generated Rs 14,500 crore as disinvestment proceeds for the government. The Disinvestment Department, along with the PFC-REC and the Pawan Hans Ltd (PHL), was earlier working out the premium at which the government would sell its stake. Pawan Hans Ltd (PHL) had managed to generate interest among bidders. On March 19, the fifth tranche of the Central Public Sector Enterprises Exchange Traded Fund (CPSE ETF) managed by the Reliance Mutual Fund anchor book was oversubscribed by 5.78 times against anchor base issue size of Rs 1,050 crore. The fifth tranche of the CPSE ETF, which gives an opportunity to invest in 11 government "ratnas", helped the government raise Rs 9,500 crore. The government has raised a total of Rs 28,500 crore from the rounds through the CPSE ETF since 2014. The ETF tracks shares of 11 CPSEs -- ONGC, NTPC, Coal India, IOC, Rural Electrication Corp, Power Finance Corp, Bharat Electronics, Oil India, NBCC India, NLC India and SJVNL.